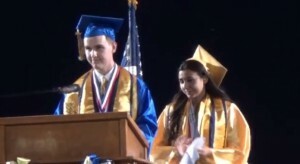 BRAWLEY, Calif. — The salutatorian at a high school in California recently defied school administrators who disallowed him from speaking about his faith at graduation, presenting a bold Christian speech that urged his classmates to stand for what is right. Brooks Hamby is a senior at Brawley Union High School. In a YouTube video posted on Friday, Hamby spoke out during his high school graduation, noting that he had presented several drafts for his salutatorian speech, each of which were rejected because of their religious content. In defying the ban on Christian speech, Hamby urged students to do what is right, even if they must stand alone. “The advice I give to you is this: No man or woman has ever truly succeeded or been fulfilled on the account of living for others and not standing on what they knew in their heart was right or good,” Hamby declared. He then quoted the words of Christ from Matthew 5. “So I will leave you with this, with a quote from the biggest, best-selling book of all time in history: ‘You are the salt of the earth, but if the salt loses its saltiness, how can it be made salty again? It is no longer good for anything, except to be thrown out and trampled underfoot,'” Hamby read. Hamby then concluded by again citing his faith. “Congratulations class of 2014, and may the God of the Bible bless each and every one of you every day for the rest of your lives,” he said, being met with cheers and applause. As previously reported, the mention of God at graduation has been a frequent point of contention at ceremonies nationwide. Last year, Roy Costner IV drew loud applause and cheers when he surprised attendees of South Carolina’s Liberty High School graduation at Clemson’s Littlejohn Colliseum following the school district’s decision to no longer include prayer at graduation ceremonies. After taking the podium, Costner took his approved speech and ripped it in half for all to see. As he spoke from a separate script for a few minutes, Costner then began to thank his parents for his Christian upbringing. As attendees realized that Costner was reciting the Lord’s Prayer, applause began to break out in the colliseum. Within seconds, the applause was accompanied by loud cheers. The district decided not to take action against Costner, stating that they would not punish him for his faith.